A news report shows the police suffocating and killing a suspected "Green Light Baby" Issa Williams. A church congregation chastises the police force for using that the green light drug as an excuse for killing people of color. They also want to find the people with dormant powers. The school board decides to keep the school closed as they find psychology help for their students, and to determine the disciplinary action against Jefferson. Agent Odell interrogates Lynn about her research, the children in the pods, and the other scientist on the case. They revoke her access to the children and tell her she can't leave town; they know she's lying. Anissa shows Jennifer the video of her floating in air and showcasing her powers. Kara rushes through a parking garage to leave, but Syonide needs her to come with her. The two fight in combat with guns and weapons. Kara stabs Syonide in the neck with the metallic spike of her high heel shoe. Lynn and Jefferson argue about their work and the safety of their daughters. Kara vists Peter seeking his help. She wants to leave the A.S.A. and get out clean without a trace; she'll get him the briefcase as a trade. She mentions that inside the briefcase is "hell." The children are still being held in the pods until the government determines their biological repercussions' the government claims to "own" the subjects. The church wants to help the families, but they would need half a million dollars to sue the government. Anissa desperately wants to help the families; however, her father says they can't help the children at this time. After an argument with her mother, Jennifer's powers react and she hits her mother with an electric blast. Lynn, feeling bad for initially cowering from her, goes to comfort her. Lynn and Jefferson argue again about what to do. She asked Peter to pull some strings in making her in charge of the pods. Anissa, in disguise, breaks into a drug den to steal money. She fights and knocks out all of the criminals. Deputy Chief Henderson deduces that Jefferson is Black Lightning and Anissa is Thunder. He has a heated chat with Jefferson, but he doesn't reveal what he'll do next. Lynn thinks Jefferson should go to therapy as well to work on some issues. The two flirt and bond once again. Jefferson and Peter agree to work with Kara to get the briefcase. Khalil leaves Jennifer a voicemail about giving him a chance to explain. After the churchgoers point their guns at a masked Anissa, she drops all the money for them. Issa Williams wakes up from the dead and exhibits his powers. His mom admits against her will that she was happy when he died from his green light troubles. He makes a run for it as the cops shoot at him. 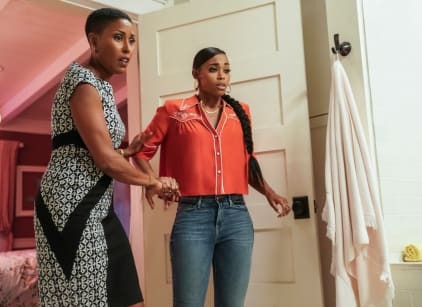 Kiesha shows Jennifer the video of Issa returning. Jennifer panics and locks herself in the bathroom; her powers manifest due to the anxiety. Jefferson arrives later to absorb her powers, which created an aura of gold light. The school board decides to close Garfield permanently. Jefferson offers to Napier Frank that he will step down as principal to keep the school open. Lynn assumes her role as the head of the pods. Kara tries to steal the briefcase from Tobias, but he surprised her in his office. He shoots her in the gut with a harpoon. She cuts the rope, and instead of fighting him directly, she crashes out the window of the building. Agent Odell: I’m not really interested in how much you’ve been studying now. I prefer you answer my question. Lynn: Excuse me, I would like to finish my answer. I‘ve been studying green light for some time now, and I understand its components and neurological effects better than anyone. Agent Odell: What happened to the other scientist managing the pods? Lynn: When we arrived no one was there, just the children in those pods. Agent Odell: So, I guess he went to the same place as, umm, the surveillance footage and Agent Proctor? Detective Odell: This is useless. I’m done here. You’re not allowed to leave town or talk to anybody about this until the investigation is over. And, your access to the pods is finished. Lynn: What? Did you not hear what I said?! I understand green light and these children better than anyone. Detective Odell: You’re a liar. You’ve been sitting here lying to me for about an hour and a half. You know you’re lying; you’re not going to admit it, and I don’t like liars. Not because they lie, because we all lie, but because they make my job harder, and I’ve got enough cow manure to deal with than to have you make my life more ... difficult. Thank you for your cooperation, Dr. Stewart. Permalink: You know you’re lying; you’re not going to admit it, and I don’t like liars.